I decided to approach the question of falling church attendance by reading an interview with someone from the Malta Humanist Association. It was about “humanist weddings”, which apparently are offered as an alternative to Church ones. In the humanist’s words, “an obvious difference between humanist ceremonies and Catholic and civil ceremonies is that more often than not, with Catholic and civil ceremonies, places for them to be held are restricted… humanist ceremonies can be held anywhere that is safe to hold a gathering… places may or may not require permits for gatherings, but more often than not, the countryside, seaside hotels or beaches make idyllic locations”. Now obviously I couldn’t care less how and where the weddings that I’m not invited to are held. Still, there are at least two things I find curious about this. First, the idea that places for Church weddings are “restricted”. The argument works, if 500+ years of history, an endless variety of styles, and many hundreds of examples all over the country, qualify as a restriction. Second, that a “seaside hotel” should be thought preferable as a wedding ceremony venue to, say, the Manikata chapel, or San Girgor in Żejtun. I haven’t been to all seaside hotels, and admittedly the db and Corinthia groups have yet to gift their masterpieces to the world. Even so, I find it hard to understand how someone might find insipid palm trees and faux-tropical gazebos preferable to a 16th-century nave. The point is that there’s a side to the statistics that deserves some discussion. In turning our back on Catholicism, we risk a general cultural impoverishment. But first, some things I am not going to talk about. Certainly I’m not about to recommend that people should go to church more often. Nor am I interested here in faith and belief, though I do appreciate how fundamental they are to believers. The two other things I’ll bypass are the Church as an institution, and the social aspects of religious practice. All of these are as beside the point here as they are otherwise important. I last went to church at Mdina, for the Christmas midnight Mass. As expected, the devil played all his aces. It was past my usual bedtime, there was a bitterly cold draft inside the church, and Mass took very, very long. And yet, the whole thing was nothing if not culturally generous. Take the sermon. 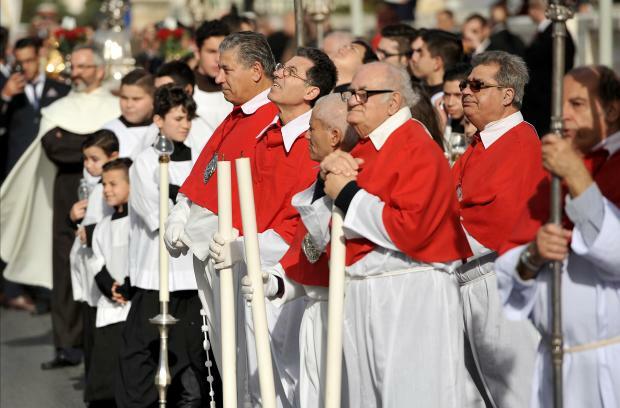 Charles Scicluna spoke about how, when the angels proclaimed peace on earth at the birth of Christ, they were talking in a double sense. That’s because there was already peace on earth, and it was called Pax Romana. The Archbishop used this twist to explore the different meanings and experiences of peace. It was one of the finest lectures I’ve ever attended, certainly at that hour. There are worse places to spend time than the cathedral, draft or no draft. Like many churches, and perhaps some more, it’s a repository of hundreds of years of tradition, from the arms of Charles V in the apse to the names on the tombstones. And, because Mass is not a museum visit, it offers a means to actually live, rather than consume, tradition. I was shocked to hear a priest say on television the other day that part of the problem with falling attendance was the Qalbna Safja and such. He was referring to church hymns which, according to him, are outdated and put people off. Shocked, because it’s philistinism of the worst kind – the same kind that makes people find no value in Catholicism, probably. Let’s leave aside Bach, or the kind of music sung by the exceptional Maltese choir Cappella Sanctae Catharinae. The Qalbna Safja hymns were actually written by some of our best poets, and in many cases set to music by the masters. That some people see no value in them is exactly what I’m talking about. Whether we like it or not, our culture is steeped in the words, sounds and images of Christianity and Catholicism. It’s almost impossible, for example, to really get the point of much of European (broadly speaking) art without that kind of cultural infrastructure. It’s bad enough that the classics are popularly no longer thought relevant. Speaking for myself, it’s been a huge task to try to patch up as best I could my ignorance in that department. Huge, as well as rewarding, because even with my rudimentary knowledge of the classics, I can now at least begin to understand Poussin, Picasso and Handel. Art is just a very small part of it. The great Christian traditions of introspection, mysticism and silence, indeed of humanism itself, are among the rest. I’m not saying the nuts thing that there is no culture beyond Christianity, or that it is necessary to go to Mass on Sunday to be culturally functional. The point is simply that to renounce that tradition is to risk being left with seaside hotels, shopping and likes on a Facebook page. The pity is that many of us who were raised in that tradition went through the motions without reaping the tremendous cultural harvest. As someone once put it, the hardest thing of all to see is what is really there.